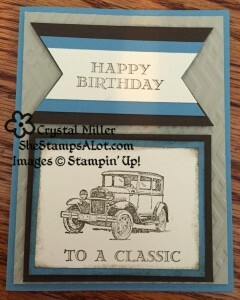 I decided to fiddle with some left over cards I had cut from Stamp Club. On the left is the original and on the right is a different version. I used the cardstock cut from the same club and The Open Sea stamp set and created this card. On the left, you will see the original card from stamp club and on the right; you will see my new version of the same card. This card was inspired by many cards on Pinterest! I first stamped the ship from The Open Sea stamp set onto the small piece of Very Vanilla card stock in Night of Navy ink. 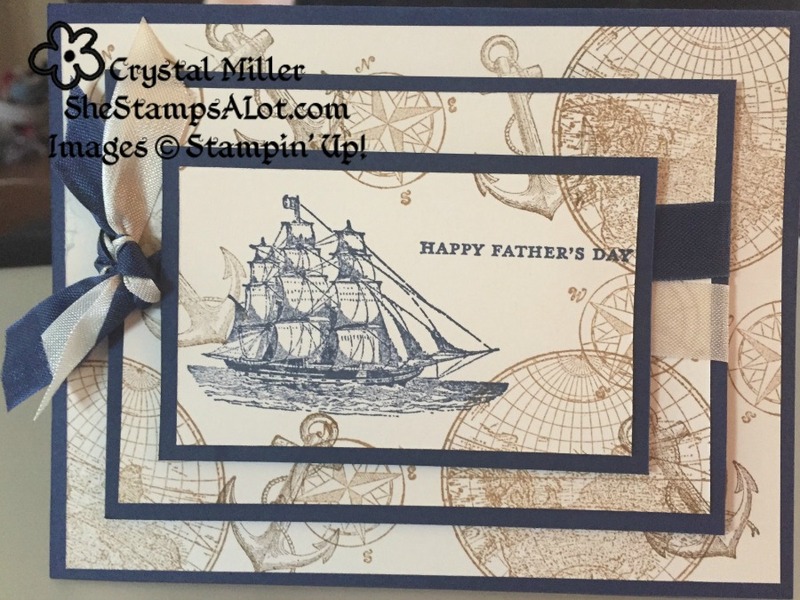 I then stamped the greeting from the Teeny Tiny Wishes stamp set to the right of the ship in the same ink. 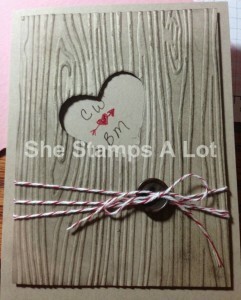 Then, I layered the three vanilla layers using washi tape for my temporary hold. I randomly stamped the globe the compass using Baked Brown Sugar ink. I then used the darker Soft Suede to randomly stamp the anchor. I attached my largest piece directly to my Night of Navy card base. 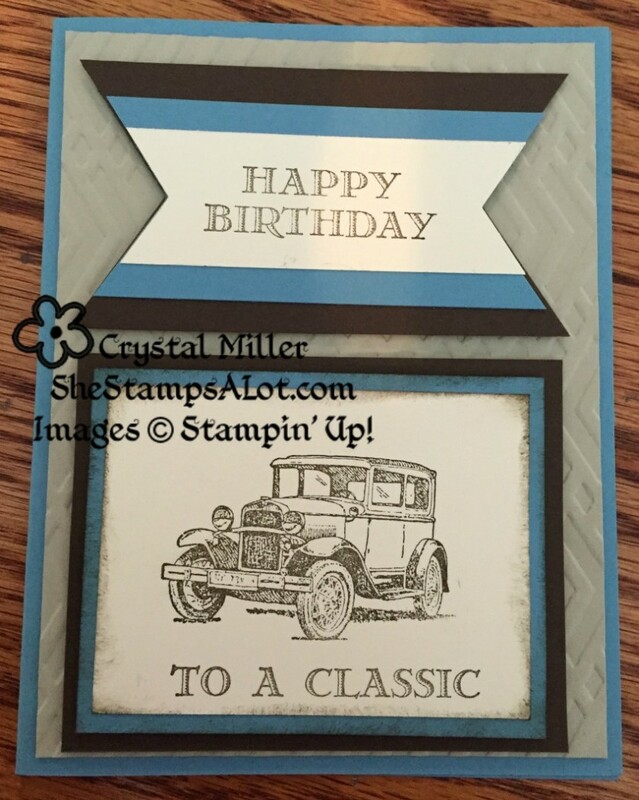 I then layered my two smaller pieces of Very Vanilla card stock to my Night of Navy card stock. I wrapped my two pieces of ribbon around my medium layer, tied a knot, and trimmed it. I then used dimensionals to pop it up from the base layer. 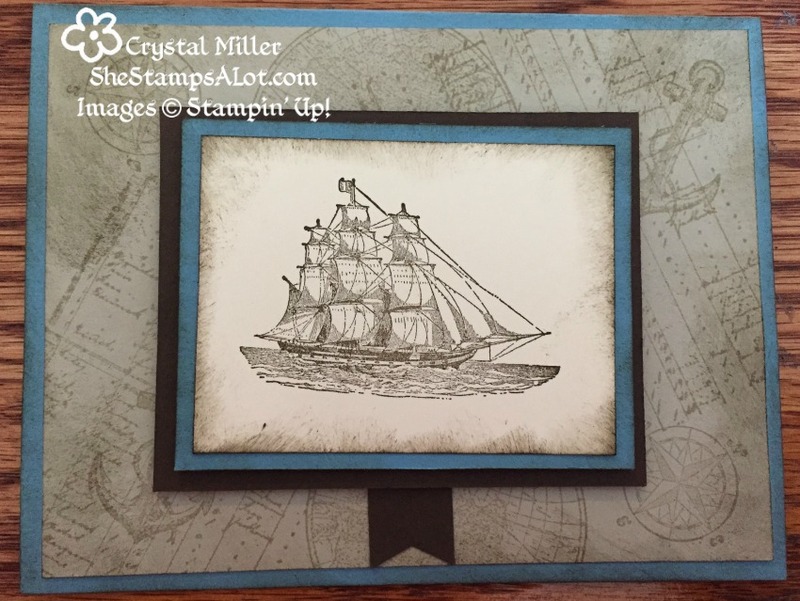 I then used dimensionals to pop the ship (top layer) to the top of the card. 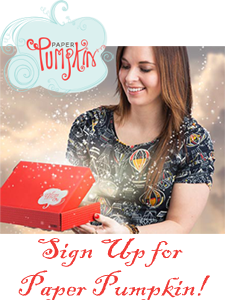 I suggest you use a scrap piece of computer paper or a scrap of Very Vanilla Card stock for anything you want to write on the inside of this card. 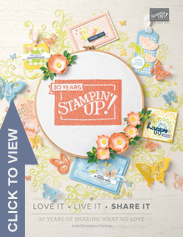 You could also you silver or gold paint markers on the inside! 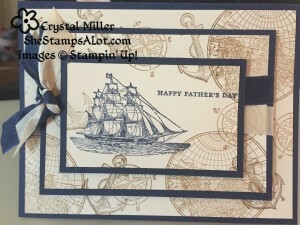 This card was inspired by two cards by fellow stamper Ronda Wade. 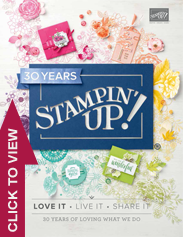 We will be making this card for stamp club this month! Cut Marina Mist 5 ½ x 8 ½ Fold in half. 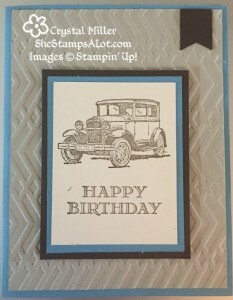 Cut Sahara Sand 4 x 5 ¼ and run through Big Shot using the Zig Zag embossing folder. Adhere to the front of the card base. Cut Very Vanilla 2 ¼ x 3, Marina Mist 2 ½ x 3 1/4 , Early Espresso 2 ¾ x 3 ½ . Stamp the car image and birthday greeting onto the Very Vanilla layer, adhere that to the Marina Mist layer and adhere that to the Early Espresso layer. Pop up all three layers onto the Sahara Sand layer. Using a scrap of Early Espresso and punch out a banner, adhere it to the top left corner of the Sahara Sand layer. 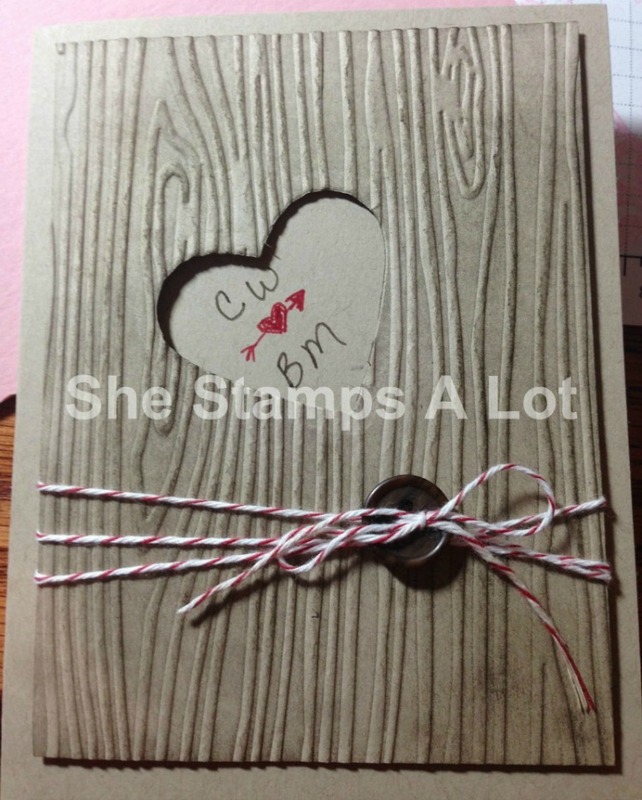 I also stamped a greeting on the inside of this card. 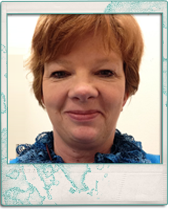 Nancy Ferb inspired my next card, she did a card similar, and I changed it up to make it my own. Using the Aqua Painters to watercolor makes even the beginner look like an expert at water coloring. I used 12 x 12 Very Vanilla paper, as it would be easier and waste less paper. I cut the card 6×6 so it would fold to be 3 x 6 and will fit in a regular size letter envelope. 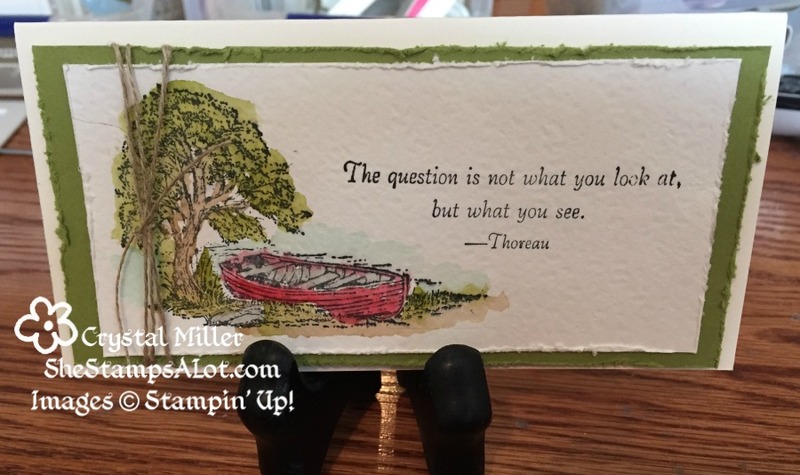 Use your Stazon Ink pad and stamp the boat stamp from Moon Lake to the left side of your Watercolor Paper that is cut 5 ¼ x 2 ½ and then I stamped my word choice where I wanted it on the same piece of cardstock. 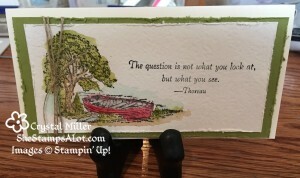 I used the Stampin’ Distress tool to rough up the edges on the Old Olive & Watercolor Paper. I smooshed up ink in the lids of all the colors I used to watercolor. BE VERY careful not to use too much water from your aqua painter…do not squeeze too much. You just need it to be damp. I used Old Olive & Soft Suede on the tree and a little on the ground to show dirt, and bushes around the boat. I used Smoky Slate inside the boat and on a few rocks near the boat. I used Pool party for the water around the boat and tree. When using the aqua painters dip the tip in the color smoosh, and gently color your subject. When you need to change the colors, squeeze a little water out of the brush and wipe with a paper towel. After your images dry, adhere the watercolor CS to the Old Olive CS. Wrap linen thread around the two pieces several times and tie in a knot. Use dimensional in all four corners and mount on your Very Vanilla Card Base. 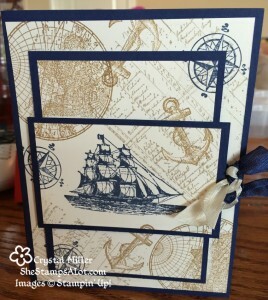 This card was inspired by a stamper named Weekend Warrior! I found it on pinterest and loved it! 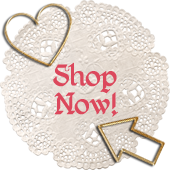 It is a great masculine card!